What does a kiss look like in EEG data? Can a kiss be translated into biofeedback data? How does a kiss feel in EEG data? Artists duo and researchers Lancel/Maat investigate social and sensory connections, privacy, empathy, vulnerability and trust by using Multi Brain Computer Interfaces (Multi BCI). During internationally shown performance installations people were asked to kiss, like a reflexive data scape. Kissing acts are orchestrated again for a poetic, digital, synthetic ritual. In live kissing experiments with Multi BCI EEG headsets, visitors are designated as “Kissers” or “Observers”. Their brain waves are measured while kissing. The EEG data is then displayed in real-time in floor projects. 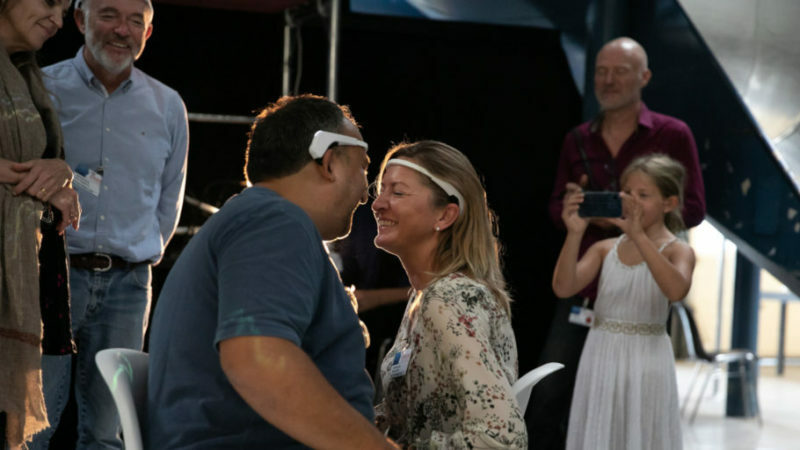 At the same time, the brain waves of the observers are measured, with neurons reflecting the activity of the kiss movements that resonate in their imagination. The combination of all data thus forms a visual and reflexive data scape, translated into an algorithm for a soundscape: a “Kissing Data Symphony”. Would you like to work on projects like these? At Eaglescience Software we are passionate about software! We believe that designing and developing software should be a daily adventure; a challenging, fun and rewarding experience. We believe in long term commitment, based on trust and transparency. Together with our customers, we are part of the software life-cycle, creating B2B-IT solutions, software for scientific research projects and the medical device industry. We transform dreams into great software!